An estimated 1.7 million women will become pregnant each year in Tanzania and all are at risk for malaria. Antenatal care (ANC) is the best way to provide focused and comprehensive care for pregnant women, including malaria prevention and control; for this key reason, more than 90 percent of pregnant women in Tanzania attend antenatal care clinics during pregnancy. Focused ANC combines a targeted assessment and individualized care for the pregnant woman to maintain a normal pregnancy. Key components include: a) health promotion and disease prevention, b) early detection and treatment of complications and disease, and c) birth preparedness and complication readiness. Jhpiego, in collaboration with the Ministry of Health, has helped to reach thousands of women in Tanzania with focused ANC services including malaria in pregnancy (MIP) prevention and control. The Three-Pronged Strategy Simple interventions for pregnant women can reduce the burden and consequences of MIP in stable transmission countries. Jhpiego’s approach promotes the World Health Organization’s three-pronged strategy for the prevention and case management of MIP in areas of stable malaria transmission. These interventions include: uptake of IPTp, with an appropriate anti-malarial drug, currently sulfadoxine-pyrimethamine (SP), delivered through focused ANC; use of insecticide-treated nets (ITNs); and prompt diagnosis and case management of malaria illness. 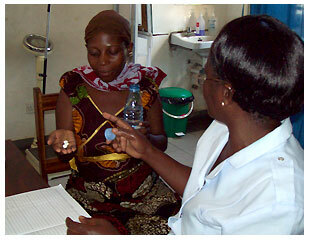 In 2000, Jhpiego embarked on a program to strengthen the health system and build the capacity of midwives, nurses and nurse-midwifery students to provide better services to pregnant women, including preventing MIP as well as providing treatment for pregnant women showing signs and symptoms of malaria. Since then, Jhpiego has improved the skills of 86 percent of all ANC service providers and about 59 percent of ANC facilities. Approximately 1,600 students graduating from the nurse-midwifery schools in Tanzania have been trained in the management of MIP. And by September 2012, it is estimated that more than 90 percent of ANC providers will have been trained under the Mothers and Infants, Safe, Healthy and Alive (MAISHA) Program funded by the U.S. Agency for International Development. Jhpiego, in partnership with Tanzania’s health ministry, has developed national training materials on focused ANC, malaria and syphilis for service providers, supervisors and trainers. The training package is used by all stakeholders who facilitate training in ANC interventions and has been translated into Kiswahili for use by providers who work in peripheral health centers and dispensaries. In partnership with local government health councils, Jhpiego has encouraged sustained funding for malaria in pregnancy training and services; about 850 providers in 40 districts have been trained as a result of advocacy efforts. Training is complemented by strengthening the supervisory skills of Regional and District Reproductive and Child Health Coordinators so they can follow up, oversee and coach ANC health providers as they implement MIP for women. To ensure that future nurses continue to provide high-quality MIP and ANC services, Jhpiego is collaborating with the Ministry of Health and Social Welfare and all nurse-midwifery schools. The skills of classroom-based teachers and clinical instructors are strengthened to ensure continuity between pre-service education and in-service training. In addition to public/government health facilities, Jhpiego is works with faith-based organization health facilities, particularly in rural areas where these groups provide more than 45 percent of the health services in Tanzania. To help service providers gauge and improve their performance, Jhpiego has developed a series of monitoring standards against which providers can measure and assess the quality of their work and plan for improvements. Building capacity, strengthening health systems and maintaining quality care are Jhpiego’s standards for success and its efforts in Tanzania are reaping dividends—the number of women receiving intermittent preventive treatment in pregnancy (IPTp) for malaria during ANC has increased. Statistics from ANC clinics showed that only 29% of women registering for ANC received any IPTp in 2001. Jhpiego collected ANC service statistics in 2008 and found that 72% of such women received the first dose of IPTp and 62% took a second dose, showing that with strengthened MIP control capacity building, health workers in Tanzania are pushing forward to achieve 2010 Roll Back Malaria targets and counting malaria out for pregnant women.